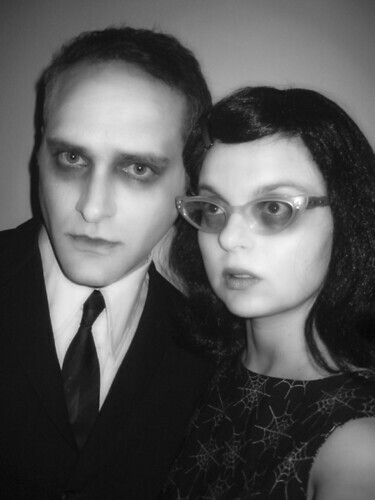 Jeff and I dressed spooky for Halloween - actually, for a show we went to last night. But 'tis the season. I loved that black flippy wig, I think I'm going to start wearing it to work, for kicks. I feel so incredibly lucky to live in the same town as Lisa. We met for dinner the other night and she is so funny, smart, and stylish. We had a lot to talk about - I was going a mile a minute, since I was brilliant enough to drink like 4 glasses of iced tea. Whee! 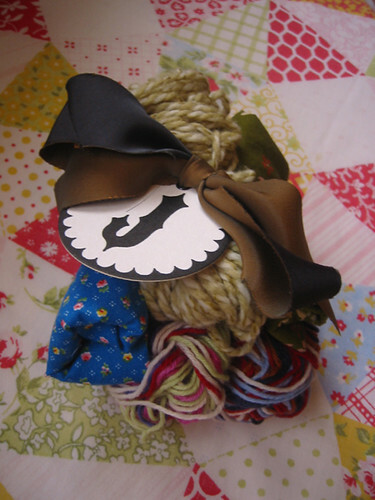 She was nice enough to give me this little bundle of craftiness, and I'm already starting to get ideas. And how about that amazing tag? Thanks Lisa! Booklet update - I have spoken to the printer, they are shipping the next batch to me early next week. I hope to have them on sale by Friday or Saturday, I will of course provide more info when I know the exact date. you look incredible in that photo! my goodness. it's amazing. so glad you like your bundle!! sounds like you are busy with those booklets. it will all be over soon! jess, i love that photo!!! it is great! What an amazing photo - looks like the Addams family meets Rudolf Valentino. Very moody and spooky.